Has any smartphone had a more unusual marketing campaign than the Nexus One? Google's touchscreen Android handset debuted in January to mostly favorable reviews--PC World gave it 4.5 out of 5 stars--but sales since then have been less than stellar. In March, mobile research firm Flurry reported that Google had sold only 135,000 Nexus Ones in the first 74 days after the phone's launch. By comparison, about a million Motorola Droids and Apple iPhones were sold in the same period following their respective rollouts. Given Google's lackluster sales pitch, it's debatable whether the search giant really cares whether the HTC-built Nexus One succeeds or fails. The company's online-only sales plan for the handset has been a head-scratcher from the start. After all, don't most consumers want to hold a smartphone before they buy it? Would the iPhone have been a mega-hit if people hadn't been able to play with the touchscreen at the Apple Store or elsewhere? And why no Nexus One TV ads? You can't change the channel without spotting an iPhone or Droid spot. The Nexus One, by comparison, lives only online. Web marketing may be a great way to reach geeks who love to study phone specs, but it won't connect with the masses who don't know what Android is--and frankly don't care. And then there's Google's choice of wireless carrier. The Nexus One debuted on fourth-place T-Mobile, which sells the phone for $179 with a two-year plan. (An unlocked Nexus One for AT&T or T-Mobile costs $529.) It's likely that Google's phone would've gotten better reception--pun intended--had it launched on frontrunners AT&T or Verizon Wireless. So is the Google phone a failure? Some industry watchers think so. 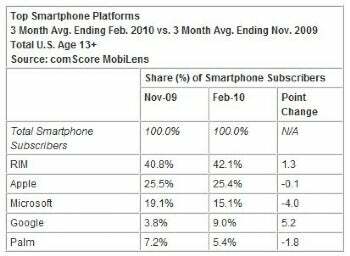 "Nexus One is a flop. Everyone knows that now," BGC Partners' Colin Gillis told the Wall Street Journal in a story on Google's scaled-back Nexus One plans. Compared with sales of competing phones, the handset may indeed be a dog. But viewed from another perspective, the Nexus One has been a success in that it helped establish Android as a viable mobile operating system. The Nexus One may not be a bestseller, but perhaps that's beside the point. The phone has served as an Android demo unit, one that shows handset and app developers what the Android platform is capable of. Indeed, more manufacturers are introducing Android devices--a development that will certainly boost Google's mobile market share.